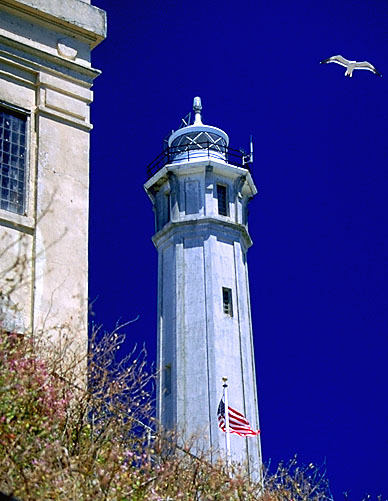 Believe it or not, the original lighthouse on Alcatraz Island was the first lighthouse on the Pacific Coast. By 1850 the discovery of gold in California brought thousands of ships to San Francisco Bay, and an urgent need for a lighthouse as a navigational aid. The U.S. Government made plans to build 8 lighthouses in the Cape Cod style with a short tower protruding from the center. This style remains today in the lighthouses at Pt. Pinos, Old Pt. Loma, and Battery Point. The third-order fresnel was first lit during the summer of 1853 on Alcatraz Island. In 1909 the original lighthouse was torn down to make way for the construction of a prison. An 84 foot tower of concrete was built next to the cellhouse, and was lit with a smaller fourth-order lens on December 1, 1909. Keepers continued to serve on Alcatraz until 1963, when the light was automated, and the fresnel lens was replaced with a rotating beacon. 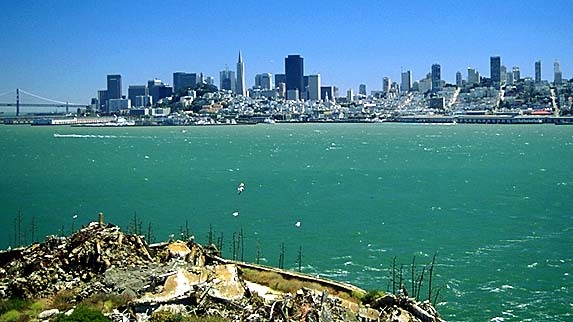 Since 1972 Alcatraz Island, the lighthouse, and the prison have been part of Golden Gate National Recreation Area. Tour boats to Alcatraz leave hourly from Pier 41 on Fisherman's Wharf. Alcatraz commands a wonderful view of San Francisco, the Golden Gate Bridge, and the Bay. But get reservations early for the ferry to Alcatraz. It's nearly as difficult getting onto this famous island as it once was for prisoners to get off.